He wants to auto delete this post upon lead conversion. A) AccountFeed: – This object represents a single feed item in the feed displayed on the detail page for a lead record. We will use above fields in the Process Criteria. 6. 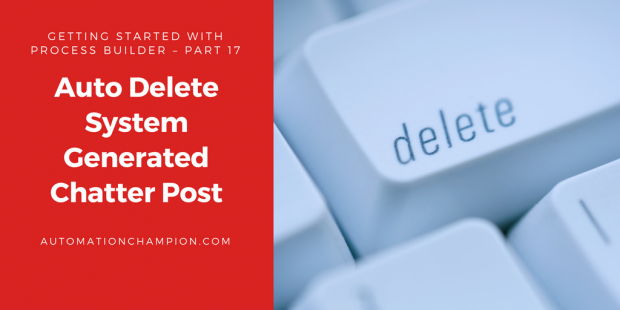 Save your flow with name Delete system generated post and close the canvas. Don’t forget to Activate the Flow. Now onwards if a business user converts a lead, then Process Builder will automatically trigger and Launch the Flow then it will delete the system generated post after a few minutes. Thanks for this. I implemented it and it works as described, however as an earlier comment notes, there is potentially some collateral damage. When I was testing, it would typically take around one minute for the AccountFeed record to be deleted. If, in that window, I added other Chatter Posts to the Account, they would also be deleted (undesirable behavior). My fix to this: change the Flow so that it first does a RecordLookup – where you lookup the AccountFeed record, sorting by CreatedDate – it will only grab the first AccountFeed record, which should be the offending post. Then you can delete it. Totally agreed with you, but it is very unlikely to happen. I found that this deletes everything – event older, unrelated chatter posts. I switched the object to FeedItem and just deleted the most recent one attached to the account, and that kept the history. Thanks for this info. Would you have any suggestions on how to modify this for another process? I need to auto delete all system generated feeds on cases. I am getting a flow error that says Error Occurred: No records in Salesforce match your delete criteria. You are getting this error because Flow is unable to find any system generated Feed. To avoid such errors, use Decision element to make sure that there is a Chatter feed. Thanks for the quick reply. I’m kind of a novice at Flow. Would I put the Decision element on the flow? Could you instruct me? 2. Then use Decision element to verify the outcome of Record Lookup element to make sure that there is something to delete. Thanks. I’m going to send you an email with my screenshots. I am still getting that error. Could you tell me what I am doing wrong? I am unable to see accountfeed object. How I can see that in flow record delete object inbox? First, enable Feed Tracking for Account object by navigating From Setup, enter Feed Tracking in the Quick Find box, then select Feed Tracking. Can you assist me with this process? I’ve attempted to recreate this and it’s not working for me in any of my environments — so I’m wondering what I’m doing wrong. Hi, Rakesh can you please guide me how to auto generate a message from Chatter (Happy birthday or anniversary) to individuals of a group and have the chatter message auto generate a post to the group? Yes, it is possible to post birthday messages to a Chatter group. Before that, you have to save Date of Birth in a field. Then use a formula field to calculate birthday in the current year, and then use Process builder with time-based actions. Why can’t it be an immediate action?